With the arrival of March comes the promise of spring—the month is said to roar in like a lion, and if we're really lucky, roll out like a lamb. Meanwhile, on or around the 21st of the month, we have Ostara to celebrate. It's the time of the vernal equinox if you live in the Northern Hemisphere, and it's a true marker that Spring and warmer, sunnier days have come. There are many different ways you can celebrate this Sabbat, depending on your tradition. 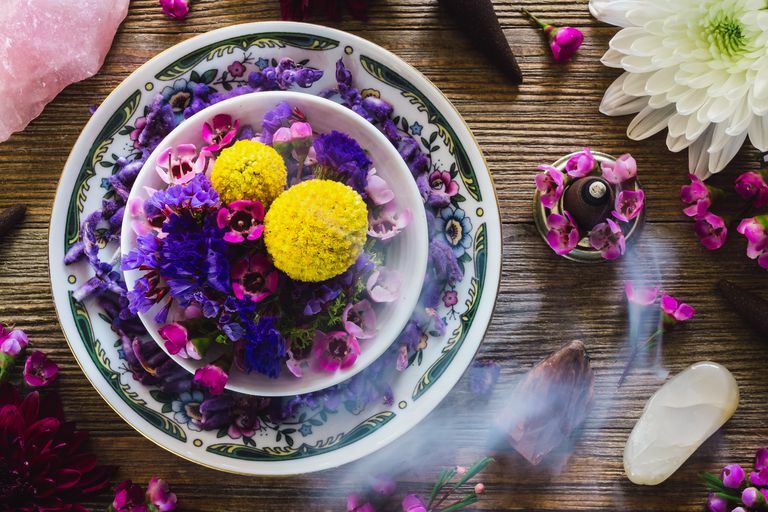 Setting Up Your Ostara Altar: Try these tips to set up your altar for the Spring Equinox. Ostara Ritual for Solitaries: This simple ritual is designed with the solo practitioner in mind. Lesser Banishing Ritual of the Chocolate Rabbit: This somewhat silly Ostara rite for kids is nonetheless fun for the whole family. Ostara Rebirthing Ritual: Celebrate the season of rebirth and renewal with this rite. Earth Meditation: As the earth begins to warm back up, use this meditation to help get yourself grounded. Celebrating Ostara with Kids: Got little Pagans? Here are some great ways to include them in your Ostara celebrations. Spring is a time of rebirth and renewal. Why not take advantage of the season to do a bit of Spring magic? Now is a good time to use spring to work on magic related to rebirth and growth. Serpent Magic and Folklore: Snakes are found in folklore around the world -- take a closer look at what they symbolize. Egg Magic and Folklore: Eggs are often associated with new life -- here's an explanation of the folklore of egg magic. Magical Spring Flowers: The earth is blooming, and spring flowers can come in handy for your magical workings. Daffodil Magic and Folklore: Daffodils are early bloomers, and have a useful magical purpose. Rabbit Magic and Mad March Hares: There's a lot more to rabbit magic than just the Easter Bunny. Magical Gardening: Growing plants is a magical act–let's look at how you can include it as part of your daily practice in the spring. Interested in learning about some of the traditions behind the celebrations of March? Learn why St. Patrick hated snakes, and why the Easter bunny brings eggs for us to eat. Ostara History: The vernal equinox has a long magical history. Here's how it's been celebrated through time. Deities of Ostara: Meet some of the gods and goddesses associated with the spring equinox. Spring Equinox Celebrations Around the World: Pagans aren't the only ones celebrating this time of year–here's what the rest of the world does during this time. Who was Eostre? : Was Eostre really an ancient goddess of spring? Easter Eggs: Pagan or Not? : Are Easter Eggs secretly Pagan? St. Patrick and the Snakes: There's a lot of speculation on whether or not the snakes were a metaphor for Pagans -- did St. Patrick really drive them out of Ireland? As Ostara rolls in, you can decorate your home (and keep your kids entertained) with a number of easy craft projects. Start celebrating a bit early with a St. Patrick's Day Snake Wreath or a basket of naturally-dyed eggs. 5 Easy Decorations for Ostara: Bring the season inside with these five simple seasonal decorations. No Pagan celebration is really complete without a meal to go along with it. For Ostara, celebrate with foods that honor the the coming of spring—eggs, early spring greens, shoots and sprouts, and of course, the all-important marshmallow Peep. Did St. Patrick Really Drive Snakes - or Paganism - Out of Ireland?